A motorcyclist is in serious condition after losing both of his legs from a hit-and-run, Pinellas Park Police say. 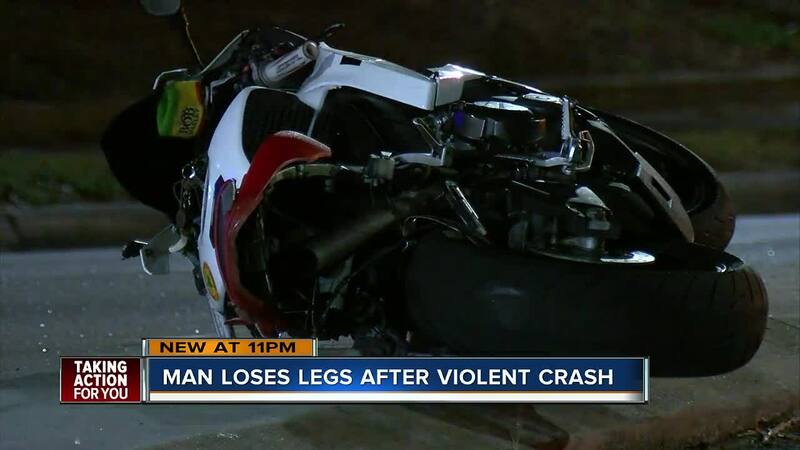 PINELLAS PARK, Fla. — A motorcyclist is in serious condition after losing both of his legs from a hit-and-run, Pinellas Park Police say. Brandon Niles, 31, was ejected from his motorcycle after hitting the back of a vehicle that cut him off, police say. A Florida Highway Patrol trooper who witnessed the crash used tourniquets to aid Niles while they waited for first responders. "He said to me, I knew if I closed my eyes, I would probably not wake up. I had to fight. I had to fight," said Liz Niles, Brandon's mother. Niles was taken to an area hospital where he remains in an intensive care unit. His mother, Liz Niles, said her son was alert and called family members while in an ambulance to the hospital. "He's the reason that my son survived. My son could not make it to the hospital without the aid of that trooper," said Liz Niles. The driver of the other vehicle, 20-year-old Jah-Vez Tierre Deon Hill-Holmes, left the scene after the accident. He later returned and admitted to the whole thing, according to police. Police say Hill-Holmes attempted to make a left turn in a Mitsubishi Galant across all lanes of westbound traffic on Park Blvd when he cut Niles off. He was arrested and taken to the Pinellas County Jail. He faces charges for leaving the scene of a crash involving serious bodily injury, driving with a suspended or revoked license and felony violation of probation for uttering forged instruments. Impairment is not considered a factor. The investigation is on-going. Bradon's family is counting blessings, grateful Brandon's children still have a father to hug. "The most important thing is he is coherent. He didn't have a brain injury and thank God for that helmet," said Liz Niles. Brandon lost both his legs in the crash and has a broken arm. His family has started a GoFundMe page to help with medical bills.